What's Wrong With My Library? Book Giveaway! 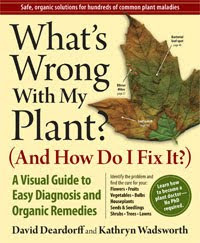 Show of hands if you already have a book in your personal library that helps you find out what’s wrong with your plant? If you raised your hand, I’m guessing you already have What’s Wrong With My Plant? (And How Do I Fix It?) By David Deardorff and Kathryn Wadsworth (Timber Press). If you didn’t raise your hand, I’m guessing that like me, you have literally hundreds of gardening books, but no one book like this one that deals exclusively with plant problems. So, let’s follow along in the style of What’s Wrong With My Plant? (And How Do I Fix It?) and see what the remedy is for your library problem. My library does not have a good book on plant problems. Do you want such a book? If yes, go to next paragraph. There are three ways to solve the problem of not having a good book on plant problems. You can purchase What’s Wrong With My Plant? (And How Do I Fix It?) for yourself. You can ask someone to buy the book for you as a gift. You can enter a book giveaway and be one of three lucky people who will get their own copy of What’s Wrong With My Plant? (And How Do I Fix It?). Which remedy would you like to try first? The book giveaway? Yes, that's what I would try first, too. To enter, leave your name and blog url in the Mr. Linky widget below and leave a comment describing one of your plant problems by Monday, November 16, 2009, 5:00 PM EST. Later that evening, I’ll randomly pick three winners who will each receive their own copy of What’s Wrong With My Plant? (And How Do I Fix It?) by David Deardorff and Kathryn Wadsworth. Be it a disease, an insect, a rabbit or a mystery, don’t hold back the gory details when you describe your plant problem in your comment. We want to know all about it so we can commiserate with you! For more information, check out my review of this book, posted on October 20th. Biggest problem the past couple of years is our sedum getting so tall and flower heavy, they fall over from the center from late summer. Is the answer staking, or pinching back early in the season? What do you do about leaf miners and those blasted vine weevils? Without causing harm to your pets? Boo hoo -- and I'd really like a copy of the book, too. So it won't be worth my while to talk about the voracious lily leaf beetle and their charming, poo-covered larvae... the kind you don't want to encounter when hand-picking without gloves. Most of my basil turned brown with spots all over it after a year of very vigorous growth and no other problems. Was it the colder temperatures? Was it edible anyway? (I got rid of it to be on the safe side.) So aggravating!! Bugs ate my rose bush leaves this year. Three different types. They were kind enough to do it sequentially, so my rose was never defoliated, but still . . . I would like to know what they are. I feel the same way. I'm a novice gardener and houseplant lover. I bought a Flamingo plant from Lowe's last winter and the tips of the leaves are shriveled with brown and gray edges as if someone burned them with a cigarette bud. I have changed the dirt and searched the net to no end and still can't find the problem.! the libraries are limited to world of plant problem issues and many a book I have miss what i need to know. Recently I had the same problem with almost all of the plants in my garden. The leaves turned yellow (or brown or red) and fell off. The hostas just melted. Oh, wait. I'm in Zone 5 and it is called a killing frost. Here's a real one: I've given up on oakleaf hydrangeas. I wonder if it is drainage or soil. *sigh* Goodness, what to do about Japanese beetles, and tomato blight, and what the heck happened to my variegated dogwood? Don't get me started on those nasty lily leaf beatles. And, what can you do about scale insect? I've tried Neem oil insecticide, but the little buggers just laugh at it, and invite their friends over. Stupid scale all over my Magnolia, making everything black with its horrible waste products. Yuck! Does it do houseplants, too? Because I think I have come down with a case of the thrips. Where on earth did I get thrips? Craziness. Our plum tree has perfectly circular holes in the middle of the leaves. No other evidence of insect or caterpillar. Just these perfect holes. Aliens? A night-time hole-puncher? Who knows? My biggest plant problem is things that eat my salad greens -- sometimes it's cabbage worms, sometimes it's slugs, sometimes it's rabbits, sometimes it's flea beetles, and sometimes it's whoknowswhat. I had sawflies (at least I think that's what it was) on my roses this spring -- how do I get rid of them before they devour my plant? Also, I've not had much success with squash the past few years. Last year it was vine borer, but this year I couldn't find the actual borer -- what else could make my vines sad? Mostly I had a wonderful gardening year. However, there was this one renegade that totally misbehaved. I bought two cucumber plants at the garden center and planted them in a hill in my raised bed. They grew beautifully and I trained them to climb two tomato cages. Then one of them and ultimately the other also, started getting wilted leaved which turned yellow then brown and were obviously dead. They seemed to die from the plant end outward. As they and the stems died, so did the cukelets so I finally threw them into the garbage...not the compost (just in case). What was it and what should I have done about it? Love your posts. They are always so interesting and current. Oh, golly, not sure where to start. Currently, something is eating my turnips greens and the little lettuce seedlings. I don't see any creatures but who knows? would you like to know about the blueberry that's struggling, the hydrangea that won't flower, or the cabbages that are either chewed on by something or rot just before they are picking size (do you know just how nasty rotting cabbage smells?). wow - I read all the rest of the comments, and it seems I have many of the same issues. Dogwood problems, japanese beetles, plants grown too tall and too bushy to stake out and too top it all off, I just found two tiny kittens in the middle of the iris leaves I was supposed to cut down. Can kittens be considered pests? Thanks for the book giveaway post. I would love to have a copy of this book. Right now, there are little white dots on the leaves of my baby pac choy. Mites are suspected, but I can't find any...hmmm. Current plant problem: floppy orchid leaves. I make so MANY landscaping mistakes, it's hard to pick just one ! But the one that I really need help with is an organic way to get rid of vine weevils in my rhodies. I can't use predatory nematodes, because we just get too cold for them. They are really notching up my leaves, and weakening the plant! I love these two rhodies, one's deep red, one's deep purple, and they are both the first things you see as you come up the driveway. I have to use an organic method, as I am Certified Naturally Grown, and they are growing in front of my pump house, and I dare not use any chemicals near my water source. When I started reading this blog I thought maybe you were writing a program or something. ;-) But then you mentioned the book's problem solving style. One of my problems is that my oakleaf hydrangea won't bloom. It's been three years since I planted it. Too much shade? Does it need to reach a certain height? Our three Forsythia bushes, planted at least 5 years ago, produce about a dozen blooms between them each spring...if we're lucky. I'd love to know why they're not smothered in blooms like the ones I see in other yards around here.